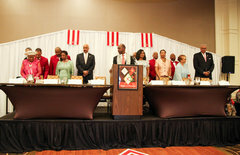 The Ann Arbor-Ypsilanti-Inkster Alumni Chapter of Kappa Alpha Psi Fraternity, Inc. is a vibrant, active part of the community. We hold many events that are open to the public and we engage in many activities that provide service to others. 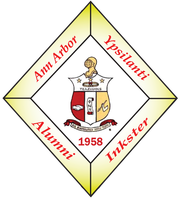 Helping those in need is a tremendous part of what we do in the Ann Arbor-Ypsilanti-Inkster Alumni Chapter. Brothers are constantly giving of their time and resources to assist those who are less fortunate than we are. Listed below are highlights of some of our ongoing activities that take place each year. The Chapter makes a difference each year by participating in the Back to School Picnic, sponsored by the National Black Pan-Hellenic Council–Ann Arbor Chapter, providing school supplies to various students throughout the area. The chapter is involved with Big Brothers Big Sisters and provides mentors and volunteers for their programs as requested throughout the year. Each year, the chapter participates in raising money through the “Bowl for Kids” bowl-a-thon with other organizations of the National Pan-Hellenic Council–Ann Arbor Chapter. Proceeds from this event are donated to Big Brothers Big Sisters. On a regular basis, usually each fall, the chapter holds its Black & White Ball. Recognition awards are presented to various Brothers during this event. Proceeds from the event support our scholarship program. The chapter holds a college fair for high school students to expose them to the best colleges and universities our country offers. During the college fair, students and parents also receive financial aid information and training. This event is held in the fall each year. 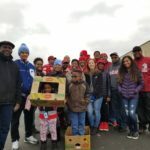 Each year, the chapter participates in coordinating the Easter Egg Hunt, which a community initiative arranged by African American Organizations throughout the community. 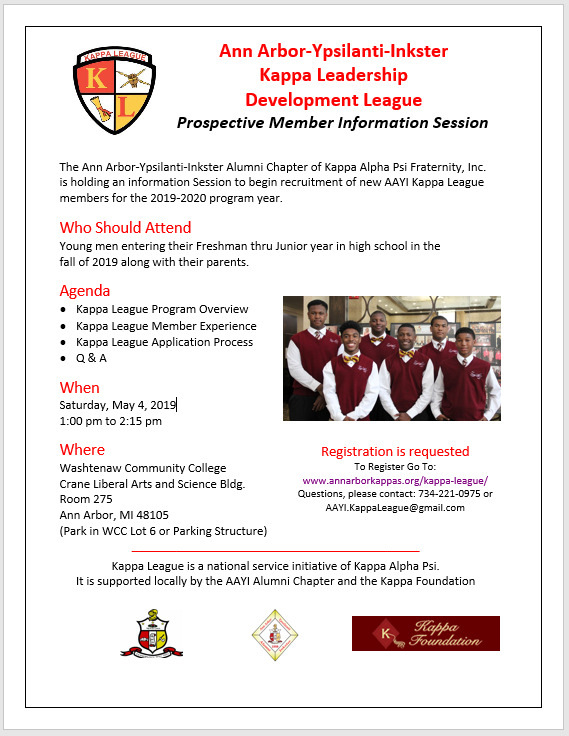 This event was started by the Ann Arbor-Ypsilanti-Inkster Alumni Chapter of Kappa Alpha Psi in 1989 and we joined forces with the other organizations in 1991. The events features the Easter Egg Hunt, magic show, book mobile, and other presentations by each organization. There are usually more than 400 children and youth (ages 2-11) who attended the event. 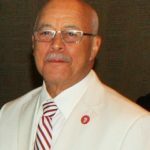 Each Summer, the Chapter holds a golf tournament in partnership with the Detroit, Pontiac, and Southfield Alumni Chapters of Kappa Alpha Psi Fraternity, Inc. Proceeds from this event support our scholarship program. Throughout the school year brothers from the chapter visit local high schools to share information about their current or past professions. Information about employment, college experience, and general life skills are shared with the students. One of the primary purposes is to prepare students for college and for employment after high school. The audience is usually 10th through 12th grade students. During the Thanksgiving and Christmas holidays, the chapter provides holiday gift baskets to families in the Ann Arbor-Ypsilanti-Inkster area. Numerous times throughout the year, the Brothers gather together to fellowship with one another at a Brother’s church for Sunday service. Brothers visited Triumph Church and Grace Fellowship Church. Throughout the year, the Meals on Wheels program continues to be a signature program for this chapter as we support this worthy cause to provide meals for the elderly people in our community. On the fourth Saturday of each month, brothers deliver meals to senior citizens in the Ann Arbor and Ypsilanti communities through Ann Arbor’s Meal on Wheels Program. 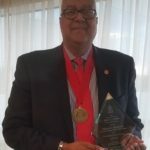 The Chapter has received recognition awards from the Ann Arbor Meals on Wheels Program for their continued participation. This event is supported by all members of the chapter on a rotating basis. Each year, the chapter participates in the Kappa Southfield Alumni Softball Tournament. This event provides a great deal of excitement and camaraderie amongst brothers from many Kappa chapters in Southeastern Michigan. One of our premier events, since its inception in 2011, is our Annual Women of Achievement Event held on the first Saturday of June each year. During this event, the Chapter recognizes dynamic women who have made outstanding contributions to the community. Each summer, members from our Kappa family march in the Ypsilanti Heritage Parade. The brothers have a great time marching in the parade and providing visibility to our fraternity.